This page is a translated version of the page Parker and the translation is 100% complete. Parker is one of the few American historical fountain pens brand remained continuously active to this day. The Parker Pen Company was founded by George Safford Parker in 1888 in Janesville, Wisconsin. Today the company is owned by Sanford, a division of Newell Rubbermaid that also owns Waterman. Although the company always produced good quality fountain pens, Parker golden age goes from the '20s to '60s, when the company has distinguished itself for its great innovation capacity, obtaining always strong success. Thanks also to the creation of a vast network of branch offices (Canada, England, Denmark, France, Mexico, and Argentina), the company always maintained top rankings in worldwide sales of fountain pens, and was successful also in the ballpoint pen era. Together with Sheaffer, Waterman and Wahl-Eversharp is a recognized member of the Big Four. 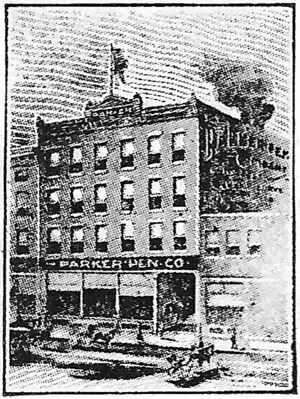 Parker was founded in Janesville in Wisconsin in 1888 by George Safford Parker, which previously had operated as a reseller for the John Holland Pen Company. George Safford Parker, who worked as a teacher of telegraphy, supplemented its income with the trade in fountain pens. Having to repair the pens that he sold, it began to improve their functioning, and because the pens he changed worked better than the original and had success, he decided to found his own company. He obtained his first patent (nº US-416944) in 1889, and a subsequent patent (nº US-512319) in 1894 for his special Lucky Curve feeder, which went back inside the pen with a special curved shape that is claimed to be able to call back the excess ink when the pen was not in use. In 1891 George Parker associated with William F. Palmer, an insurer and they incorporated The Parker Pen Company in Janesville. In fact, the "Lucky Curve" was simply a good feeder, which remained in production until 1928, and was used as a trademark for a number of pens, but there are doubts that the curved form actually had the effect to avoid the accumulation of ink, because much repairers cutted it, because the curved part makes it difficult to reinsert it between the nib and section. 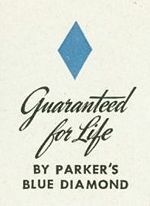 In the early years Parker began manufacturing good quality hard rubber pens. In this period it was famous for her silver overlay pens, and in particular for the Snake pen with a snake shaped overlay, that is sought after by collectors for its rarity, and for the Black Giant pen, characterized by a very large size. Another distinction point for Parker pens was the creation of button filler, introduced in 1913 as reaction to the creation of the lever filler, which was never been used in the company's flagship models, despite is diffusion between all the competitors of that time. 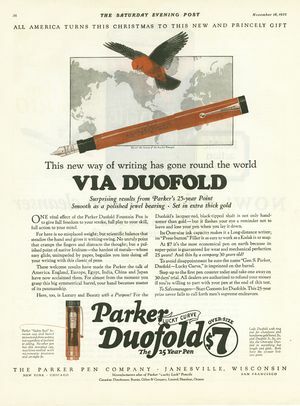 Parker continued to produce hard rubber pens with good results, focusing on the functionality of his pens and on the benefits of the button filler, but the real breakthrough came in 1921 with the launch of Duofold, which was a huge success, by getting the company at the top of sales. The creation of a large pen, made ​​of hard rubber of a bright red color, was a revolution in the fountain pen world until then dominated by the black color, and foreshadowed the introduction of the celluloid colors by several years. The success of the Duofold, despite its price (10 dollars) was high for the time, continued for over a decade in which the models were revised several times, adjusting the production to the introduction of new materials such as celluloid or the new Streamlined style with tapered models. In 1923 was opened a plant in Canada, and was introduced a Lady Duofold model for women. In 1926 also the Parker began to move production from hard rubber to celluloid. All color for Vest pocket Duofold. In 1926 was introduced an economic model, the Parker DQ, named such as Duofold Quality and at the end ofhe same year the company introduced also the Pastels models in pastel colors, as an alternative to the Duofold ladies models, sold at a lower price. But with the coming of Great Depression, the company was faced with a critical period. In 1929 the profits that were enormous suffered a steep fall, many producers failed and others had to sell off their pens at low prices. Parker, that taken years to establish its brand, decided not to devalue his pens, and kept prices high for the Duofold, but in order to compete in 1932 introduced a range of economic models, school-type, for which they did no advertising. These models did not have a name and are usually indicated by collectors as Thrift Time, or depression pen. A Vacumatic advertisement of 1941. The company, the had wisely piled stock in the good period, continued to invest in research, testing new materials and new filling systems, up to the realization, in 1933, of the wonderful Vacumatic, with the arrow clip drawn from Joseph Platt (patent nº US-D088821, who has since then become the company symbol) with a transparent tank thanks to the new filling system with the same name. The new pen reported the company at the top of the market. In 1939, following a trend initiated by Sheaffer with his White dot and followed by other brands, also Parker adopted a symbol to indicate the lifetime warranty, putting in the head of their pens clips the Blue diamond, a small diamond in blue enamel. Unlike what happened for other brands the symbol was introduced late and for a relatively short period, going to disappear after a few years. The Blue diamond for lifetime warranty. 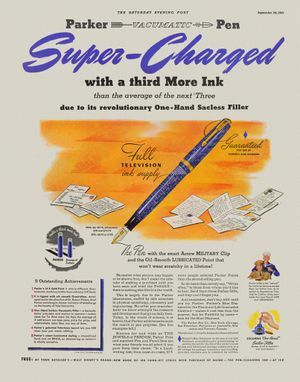 Despite the commercial success and the good technical quality of its pens, the Parker continued to invest heavily in research and innovation, and in 1941 introduced a revolutionary model, the 51, between the first pens made ​​of plastic (Lucite) with a characteristic hooded nib, which is necessary for the use of a new quick drying ink (the Superchrome Ink), which tended to degrade the celluloid. The pen, although could not be considered particularly beautiful, and despite being built in ordinary plastic, was a tremendous success, and is probably the most sold fountain model of all time. The 51 had a number of changes in the following years, such as switching in 1948 to a new the filling system called aerometric, the creation of different versions, including some luxury models in precious metals or with complex decorations for the metal cap. Some of these are extremely rare and highly sought after by collectors. In the following years the Parker continued introducing of new models and new technologies as the unique capillary filler of the 61 model, or the realization of T1 model in titanium. The company was active in the fountain pen market with luxury and economic models, and at the same time achieved great successes in the production of the new ballpoint pens. The Parker is always remained active in the market, although since 1976 the company obtained more profit by the temporary employment agency Manpower than from the sale of pens. In 1993 the pen production division was acquired by Gillette Company, which already owned the Paper Mate. In 2000, Gillette gave the division the writing instruments Newell Rubbermaid, which already owned the Waterman. ↑ according to what is said in this page. ↑ as reported by Richard Binder on this page who also reports a subsequent production, demonstrated by the presence of a model with a 1938 dating code. ↑ we use the one indicated as official by Richard Binder in this article. This page was last edited on 24 February 2019, at 01:30.